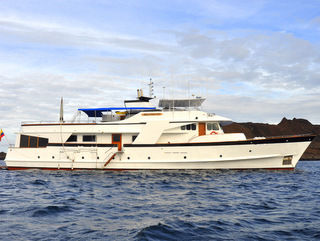 Experience the exotic Galapágos Islands by sailing aboard the superior first class motor yacht, the Beluga. Cruise the crystal clear waters of the archipelago, going ashore daily in the company of a park-ranger guide to explore and delight in the rich diversity of ecosystems, flora, and fauna. We believe that to travel responsibly, a portion of our tour cost should benefit the communities we visit. For this trip, we will donate to The Charles Darwin Research Station, whose work is focused on the conservation of the habitat and unique wildlife of the Galapágos Islands. Departures available throughout 2018. It’s not too early to book for 2018! Transfer to the airport for your flight to the Galápagos and board the Beluga. Afternoon: Visit Cerro Dragón (Dragon Hill) on the northwest side of Santa Cruz. On the dinghy ride to the lagoon, see rays, sharks, and marine turtles. The trail up Dragon Hill passes saltwater lagoons where flamingos and other shore birds feed. Encounter your first land iguanas in their hillside nesting habitat. Morning: Land on Barrington Bay’s white sandy beach, a resting place for sea lions. Along the walking trail, you’ll see the massive Santa Fé Opuntia cactus—the largest cacti found in the islands—a favorite food of the land iguana. Spot the bright yellow Santa Fé land iguana with large spikes along its spine. Afternoon: Plaza Sur is draped in sesuvium, a dense ground cover that changes colors with the seasons. The small island is home to a large bachelor seal lion colony and one of the largest populations of land iguanas in the islands. Spot coppery-colored land iguanas munching on green prickly pear cacti. 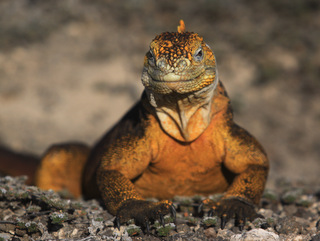 This is the only place in the world to see hybrid iguanas—a fierce cross between marine and land iguanas. Morning: The coral sand beach is home to sea lions, brown pelicans, blue-footed boobies, and marine iguanas. Sea turtles, Galápagos sharks, and rays swim in the clear waters. Frigatebirds and boobies float on the air currents. Afternoon: Visit either El Junco, a freshwater lake at 2,300 ft. with tree ferns, the endangered Chatham mockingbird, pintail ducks, and common gallinules or Cerro Tijereta, a frigate bird colony home to both the Magnificent and Great frigate bird. End an active day with a visit to the Galápagos National Park Visitor Center, which focuses on the history of the archipelago’s ecosystems, flora, and fauna. Morning: Enjoy the extensive white sand beach at Gardner Bay. Darwin’s finches and Española mockingbirds can be seen flitting among the sea lions. Relax on the beach or snorkel near Islote Garnder and Islote Osborn; swim with sea turtles, manta rays, and schools of tropical fish including surgeonfish, king angelfish and parrotfish. 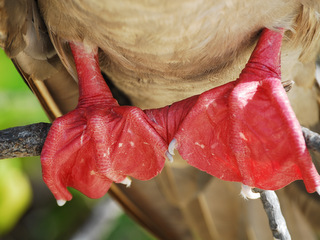 Afternoon: Punta Suarez is home to a wide variety of wildlife. 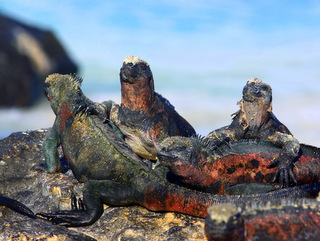 Sea lions, marine iguanas, and the colorful Española lava lizards can be found along the beach. Nazca and blue-footed Boobies and Galapagos hawks nest along the trails. 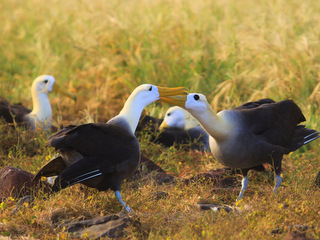 The waved albatross breeding colony—the largest birds in the Galápagos—is the highlight between April and December. Morning: Enjoy a stroll through the quaint streets of Puerto Ayora. 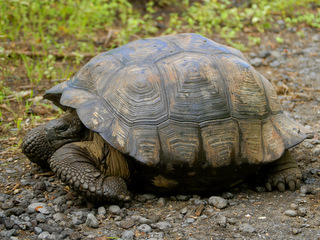 A short walk from the center of Puerto Ayora takes you to the Fausto Llerena Tortoise Center—the successful giant tortoise breeding and repatriation program jointly run by the Galápagos National Park and the Charles Darwin Foundation. Afternoon: Drive into the lush forests of the Santa Cruz Highlands to mingle with Galápagos giant tortoises in their natural habitat. The vermillion flycatcher and almost all birds present in the Galápagos Islands can be found here. Morning: Make a wet landing on Sombrero Chino, a small island composed of delicate lava and spatter cones. 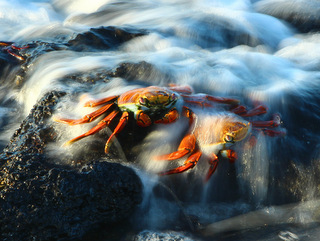 Explore the white sand beach, home to sea lions and colorful sally lightfoot crabs. Sharks, rays, sea lions, and Galápagos penguins are bountiful in the clear waters. Afternoon: Rare pahoehoe lava and other evidence of recent volcanic activity can be seen along the trail through Sullivan Bay’s black lava field on the southeastern side of Santiago. Even in this harsh environment, life takes root—the lava flows are speckled with tiny Mollugo plants, one of the first plants to colonize newly formed lava. Morning: Land on the beach in Darwin Bay, a tidal lagoon lined with red mangrove and soft-haired prickly pear. Red-footed boobies, Noddy terns, frigatebirds, and storm petrels abound, as do many other birds, giving the island its nickname of ‘Bird Island’. Pass through Palo Santo trees and saltbushes inhabited by nesting birds as you climb to the edge of the cliff for the spectacular view of the island. Afternoon: Travel by dinghy to Prince Philip’s Steps and see fur seals and birds sheltering on the lava cliffs. 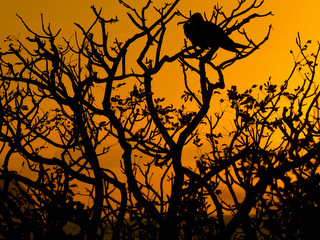 Climb a steep set of steps through colonies of Nazca and red-footed boobies to reach the plateau and more colony sites. Near the end of the trail, view wedge-rumped storm petrels. Morning: Your final stop is Black Turtle Cove, a mangrove cove on the north coast of Santa Cruz where pelicans and herons roost and marine dwellers, such as sea turtles and golden rays, may glide along your dinghy as it makes its way through the mangrove lagoon. A bus ride to Balta airport completes your visit to the Galápagos as you board your flight onward. 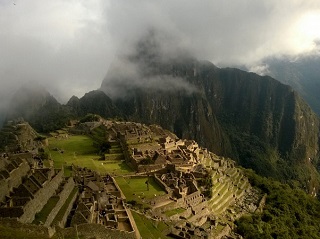 Choose to extend your stay and visit the pristine Ecuadorian Amazon, the ancient ruins of Machu Picchu, and/or other South American destinations. Ask for details.